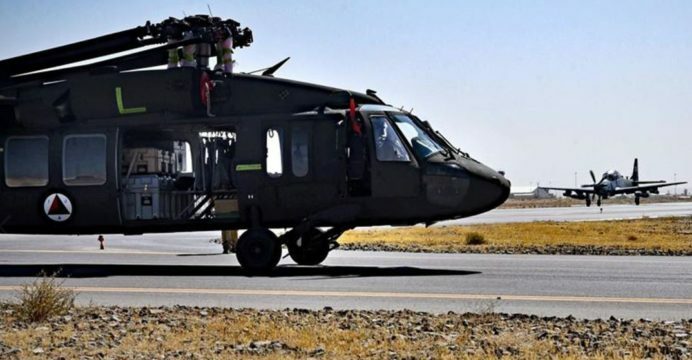 The Afghan Air Force (AAF) has taken delivery of its first four Sikorsky UH-60A Black Hawk transport and utility helicopters from the U.S. The announcement was made by the 438th Air Expeditionary Wing, which released photos of AAF UH-60As being off-loaded from a U.S. Air Force Boeing C-17. In November 2016, the U.S. announced that it will procure, refurbish and upgrade 53 surplus U.S. Army UH-60As for the AAF. The U.S. intends to replace Afghanistan’s Mi-8/Mi-17 transport helicopters (of which there are fewer than 100 in service) with the UH-60A. Afghanistan could ultimately receive 159 UH-60As. One of the goals of the program was to have U.S. aid and assistance programs benefit the U.S. economy. These will join 30 additional MD Helicopters MD-530F Cayuse Warrior (to join the AAF’s existing 27 MD-530Fs) armed scout helicopters and the remaining eight of 20 Sierra Nevada Corporation (SNC) A-29 Super Tucano turboprop-powered close air support (CAS) attack aircraft. With TAAC-Air [Train, Advise, Assist Command-Air] spearheading AAF training and maintenance support efforts, the U.S. is trying to optimize the AAF for counterinsurgency (COIN) operations. This has seen the AAF induct the MD-530F and the A-29 for CAS, with the A-29 also being available to carry out precision-guided air strikes. While AAF crews are gradually assuming more of the support responsibilities, TAAC-Air is expected to remain for the foreseeable future, though it intends to shift most of the maintenance load to the AAF. TAAC-Air intends to see the AAF manage 80% of the A-29’s maintenance work by 2022.